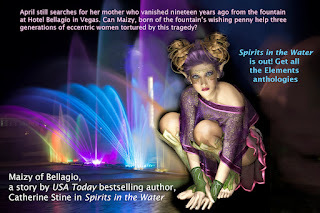 Momma Says: To Read or Not to Read: Spirits in the Water Tour and Giveaway! Spirits in the Water Tour and Giveaway! A human form erupted from the river with the force of a geyser. Arms clothed in froth wrapped the eel fisher before his wits recovered enough to raise his own arms. At the center of his back, the creature's limbs crossed and flowed together into a single watery rope. A blue-green wave molded itself to the fisher's chest and neck. He overbalanced, falling toward the river under the water creature's clinging weight. Merliss questioned why the man did not scream for help, and then she understood. A liquid head had fastened over the eel fisher's mouth. Fluid tendrils stuck out across the crown of the creature's head, and a white orb glowed through a slit where Merliss expected an eye. Her cattish aversion to water swelled her horror. A wave crashing against a rock spread more than enough of its dirty wetness, but a sentient wave that wrapped its wetness round its victim seeded nightmares. Wings thrashed overhead. The raven left his branch, cawing a warning to all who could hear, near and far. Merliss's heart pounded at her throat. Crowlluk smelled it too, she thought. Death exuded a scent as peculiar as magic.